Down At Dawn presents a reissue of Sonny Rollins's Worktime, originally released on Prestige in 1956. 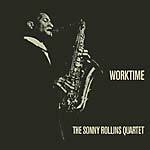 Worktime was the first Rollins album as a leader, following on from his historical two year collaboration with the maverick Clifford Brown/Max Roach quintet. One of the greatest tenor saxophone players in the history of jazz is caught here in top form, featuring a hard-swinging quartet with impeccable pianist Ray Bryant, bassist George Morrow, and drums colossus Max Roach. Edition of 300.